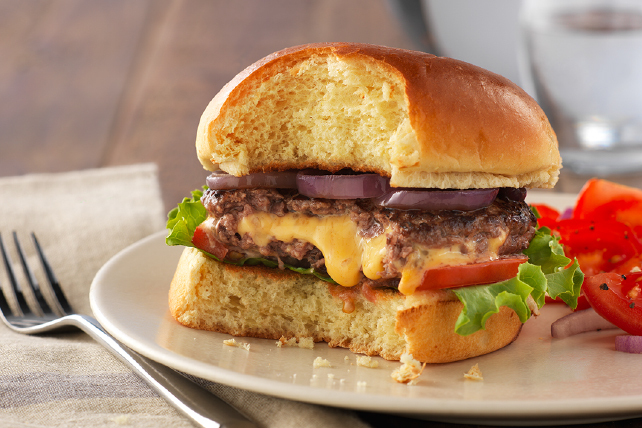 Try our Inside-Out Cheeseburger where tasty cheese melts into the patty. Cookout guests will love the unique burger flip of the Inside-Out Cheeseburger. Shape meat into 8 (1/4-inch thick) patties. Top each of 4 patties with 4 Singles pieces; cover with remaining patties. Pinch edges together to seal. To prevent the onion slices from separating onto rings when grilling them, thread slices onto 2 parallel skewers before grilling as directed. It's best to let these delicious burgers stand 3 to 4 min. before sinking your teeth into them. Substitute 1 cup VELVEETA Cheddar Shredded Pasteurized Prepared Cheese Product for the KRAFT Singles, filling each stuffed burger with 1/4 cup shredded cheese. Place buns, cut sides down, on grill grate; grill 1 min. or until lightly toasted.